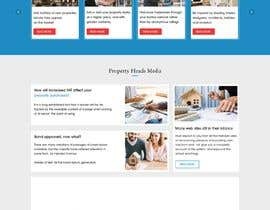 We are looking for a more professional design for the landing page of a large property network launching soon. Style: Consumer facing but professional. Crisp, modern, straight lines. Use the corporate colours, blue, white and a little red. Some movement / colour changing / or something else to make it come to life. See files for landing page. you needs just design not codding m i right? Do you want the same UX? #guaranteed Hello, I have checked your website. and I can make it redesign but Can you please make it #guaranteed and let me know what types of the final delivery of project file. I can't make it guaranteed, that is why I did a contest. I want to see work first.